The hot water washing tank is an upper open structure with functions of automatic temperature control, heat preservation and stirring. Which also has the advantages of fast heat transfer, large temperature difference and convenient cleaning. Widely used in waste plastics and other industries as heating, cleaning treatment. The hot water washing tank is especially suitable for small, medium and large cleaning chemical fiber factory. And can adopt a completely closed structure according to technological demand. The hot water washing tank is necessary equipment for PET thermal cleaning line. Through the heating of water and the use of chemical additives, the material is cleaned more thoroughly. The tank can be customized according to the actual needs of customers. 2. Heating method: use coal or natural gas for heating.Water is the heating medium, producing heat energy to heat the material in the tank. 4. Temperature control: the temperature is measured and controlled by connecting the thermocouple with the temperature controller, and the temperature of the material can be adjusted. 5. Tank body: mirror finish on the internal surface. 6. Upper cover: two open movable covers, easy to clean, with mirror finish treatment on internal and external surfaces (roughness Ra ≤ 0.4pt). 7. Inner tank bottom structure: it is processed into R Angle by spinning, and there is no dead Angle after welding and polishing with the inner tank body, and the cleaned material is free from retention. 8. The surface treatment method of outer shell: Mirror – polished matte finish. 9. Stirring device: the top center is stirred. 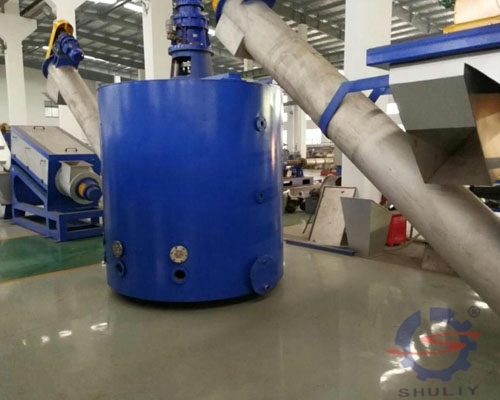 The output shaft of the reducer and the paddle shaft are connected with a movable sleeve for convenient disassembly and cleaning. 10. Stirring speed: 15 ~ 120r/min(constant speed);Paddle forms: frame type, anchor type, blade type, turbine type, etc. (according to process requirements). 11. Supporting form: tubular type. 12. The opening hole of each inlet and outlet pipe and welding place of internal tank body adopt flanging process arc transition, which is smooth and easy to clean without dead Angle, and beautiful in appearance.